New Zealand’s rich abundance of fish in the lakes, streams, and surrounding Pacific Ocean is a wonderful source of food and fun. This is a well-known fact by the native Maori, and their fish-loving Polynesian ancestors, and something that has made the capital, Auckland, a destination for fly and offshore fishermen. Many international fishing championships have been held here, and many fishing outfitters will offer guided trips to New Zealand for experienced fly and deep sea fishermen. This country offers so many varied opportunities, though, that you do not need experience to fish here and to do it successfully. Read on to take a look at some of the best areas in the Auckland region to fish and some of the most sought-out species to catch. New Zealand has been changing their rules for non-resident fishers in the past few years. It is still possible to get short-term day licenses, but not season licenses if you not a citizen. Day licenses can be purchased online or in person at a fishing store. If you go out with a charter group, their license will usually cover you, but it is always a good idea to ask. When it comes to fly fishing, Auckland is one of the best places to go. There are four main stream systems or watersheds: the Waikato, the Waipa, the Whanganui, and the Waihou. Many reaches of this are easily accessed by driving a car and parking along roadsides, and there are stretches for every level of fisher from total beginner to expert. These regions are surprisingly not overcrowded, as many people who go looking for good trout streams will go to more remote areas. This area is best known for rainbow trout, and it is not uncommon in these streams to catch several dozen fish in a single day. 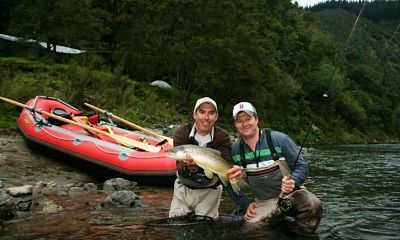 It has been such a popular choice for fishing that the Auckland area was host to the world fly fishing championships in 2008. Most of the fish range from one to two pounds, a perfect size to take back and fillet or smoke. If you are a visitor, any fishing outfitter can direct you to a good place to fillet, pack, and ship your fish. The high season for fishing trout in Auckland is from October to the end of December. The season continues until the end of April, and in some cases, May. A second popular fishery is in streams and called coarse fishing. This means fishing for koi, perch, carp, tench, catfish, and goldfish. Many of these species are invasive, and the open seasons are designed to provide both an opportunity for fishermen to be able to catch something year-round, and to enlist help in removing species that have hurt populations of native fish. There are several local lakes which offer the chance to fish for trout and coarse. From reservoirs to natural lakes, the landscape is full of wonderful cold, still water that is full of stocked, natural, and introduced fish species alike. Though some of these lakes offer dock access, much of the best fishing is by boat. Small, open fishing boats with trolling motors are a great way to explore the region, cast a few lines, and see the beautiful scenery around the Auckland area. The most urban of these lakes is Lake Pupuke. It is actually situated within Auckland’s urban city limits, and provides a great place to fish if you do not have transportation to drive out of the city. Popular trout lakes include Parkinsons Lake to the south, which is well-stocked and provides excellent rainbow trout opportunities geared toward beginners. Lake Whatihua, also known as Thompsons Lake, has a lot of vegetation for fish to hide, and is best fished with either a rowboat or kayak to keep from spooking the fish. The Mangatangi Reservoir is in the Huana mountain range to the south and has stricter rules about clean gear. There is no fish cleaning near its waters due to the fact that it also provides clean drinking water to the downstream area. The Mangatawhiri Reservoir is located in the same mountain range, and has similar clean water regulations. Both are excellent sources of rainbow trout. Yellowfin Tuna: Tuna may seem like a commonplace fish to the non-fisher, as it is easy to find canned on any grocery shelf. When it comes to fishing tuna, however, it is anything but common. These yellowfin can be several hundred to several thousand pounds, and a fresh fish is excellent eaten both raw and cooked, and a particularly large one can bring a hefty price in the five-to-six-digit range when it is sold sushi-grade at a fish market. Tuna are very strong and an excellent fighters. They are one of the most prized catches of any sport fisherman. Snapper: This is the biggest prize for many local fishermen. Snapper is a general term for many different kinds of fish that are also known as rockfish. These fish can run large, into the twenty pound or more range, and often come in bright colors like reds, oranges, and yellows. Snapper as a meal has a flavorful, delicate white meat that is easy to cook and can go with just about any kind of seasoning. They are not big fighters, which make them a prize that rarely gets away. Marlin: These large, dolphin-like, deep water fish are often mistaken as swordfish with their long pointy noses. A favorite of fishers around the world, including authors Ernest Hemingway and Zane Grey, this is a favorite warm-water target. These fish are great fighters, fun sport fishing, and for those who like trophies, make excellent preserved specimens to hang on walls. These fish can push into the thousand-pound range, and are both excellent to eat and fish. 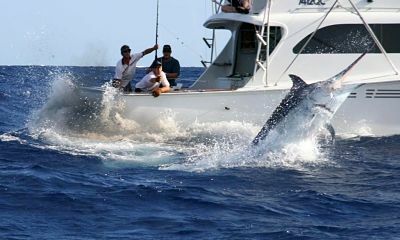 Bilfish: Like marlin, which are in the billfish family, these fish are vigorous fighters and swimmers. They make excellent fishing and eating, as well as impressive trophies. They are deep water fish, so fishing these and marlin requires the seaworthiness to bear some mid-ocean swells. Kingfish: The kingfish is better known in North America as the amberjack or yellowtail amberjack. They are fun fishing, but have become rare in New Zealand waters due to the high fishing pressure on their stocks by nearby trawlers. They are becoming an aqua-cultured species grown in pens in Pacific nations, so there may be a resurgence of these stocks in coming years. 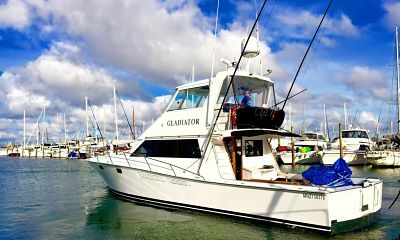 A good boat for deep sea fishing in New Zealand should have a few features. Like all fishing boats, it should have an open area that gives room to move without obstructions, and is very easy to scrub down after a trip. There is usually wind on the ocean so a closed cockpit will make you significantly more comfortable on a trip, even during the warmest days. This will also provide sun protection during the winter months, when temperatures are the hottest and the sun is the warmest. Boats with a deeper keel and more weight will be less likely to be tossed around if you are in a squall, and many boaters use the rule of thumb that your boat should be over 20 (or in some cases 25) feet long to go out of sheltered bays and feel safe and comfortable. If you are renting or chartering a boat, it is always a good idea to ask about flotation devices and emergency kits, and to double check for yourself that items like flares are up to date and not expired. No matter your favorite fishing style and skill set, Auckland offers an excellent slate of fishing opportunities for guests and residents alike. Whether you want to fish for one day or every day, opportunities abound. The hardest part of planning a fishing trip to Auckland is not finding fish, but deciding where to begin.